We all have our dry skin days (for those of us with normal skin). This is especially so when we are working in extremely drying air-conditioning environment that makes our hands and legs feel so dry and itchy. I have a bottle of Nuxe Huile de Prodigieuse in my office, all ready to be slathered on my skin whenever I feel dry. 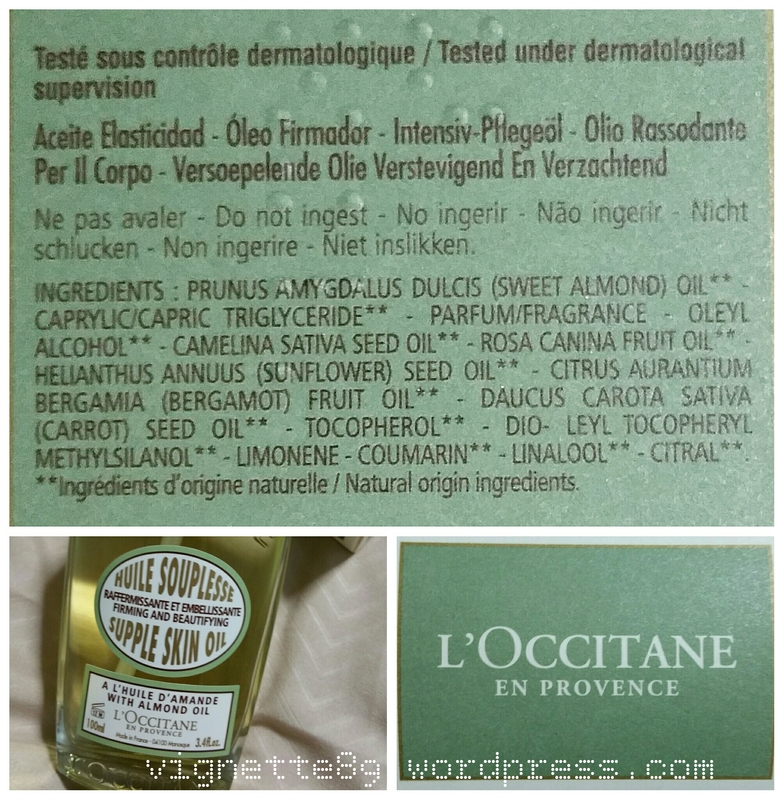 A proponent of using oils for my skin, I read about this L’Occitane product online and decided to buy it when I was passing through the shop two weekends ago. The Amande Huile Souplesse is made of the following key ingredients: Huile d’amande, Huile de caméline, Huile de Rosier Muscat (ie Almond Oil, Camelina Oil, Rosa Canina Fruit Oil). From the L’Occitane website in Singapore, it said that “Formulated with more than 50% almond oil, this light, fine body oil effectively helps skin feel firmer and smoother. Skin feels nourished and more supple thanks to the ideal combination of almond oil and camelina oil, rich in omegas 3 and 6. This balance provides suppleness and comfort to the skin. A silicium derivative leaves skin looking firmer and tighter. Applied with a spray, this oil melts into the skin, enveloping it with a subtle and mouthwatering scent of fresh almonds while leaving a delicious satiny-smooth finish. After one month of use, skin feels more comfortable, supple, and firmer. I did find the product very nourishing. The scent is warm and welcoming (I just want to sleep in it!). The scent does not last super long – I guess thats how it is when the oil is natural; but the oil leaves a layer of “film” on your skin – which I thought it was still there after 1 round of shower in the following 24hours. I have only used it once (hubby finds the scent from initial application too strong) and will continue to use it coz I like the moisturizing effects. Will need to use it for 1 full month (sorry hubby!) before I can tell if it really delivers the effects described above. This comes with a spray nozzle so its easy to dispense. Squirt some and apply on your arms, legs and body for hydration / moisturizing. Apply in circular motion (I like to also put pressure on my acupuncture points on my legs for improved circulation). However, I was told not to apply on the face as it will be too rich. Rub gently till the oil is fully absorbed. 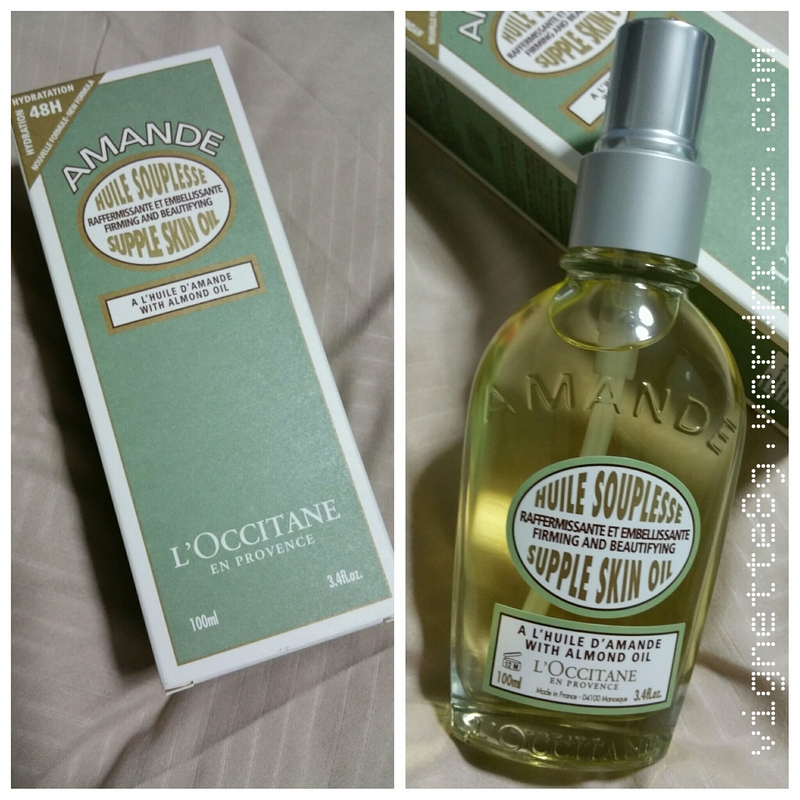 I bought it from L’Occitane boutique in Singapore. It has other Almond based products but I thought I should just stick with this first. Its a little pricy (about S$75 a 100ml bottle) but you will soon realise that a bottle like this last a long time. Once open, the bottle must be used up in 12 months from date of opening. A collection of billingual short essays from daily experiences. Advertising & Digital Creative | Social Media Blogger | eBook Author | 資深廣告人 | 愛創作、廣告、音樂、韓劇、觀貓 | Welcome to contact me at "mail2wc@yahoo.com" for job invitation. Thank you! Natural Cosmetic Ltd. is a Bulgarian company, specialized in production of Face and Body Care Products with Essential Oils.